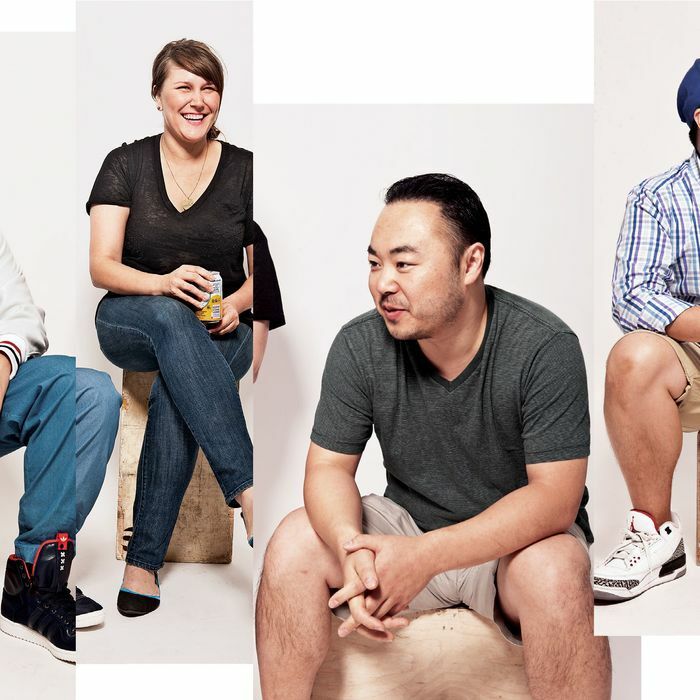 From left: Eddie Huang, Lindsay Salminen, Hooni Kim, Dale Talde. Photo: Danny Kim. On the cheap-eats front, this has been the year of ramen and buns, Sichuan and Shaanxi. The buzziest openings were both Asian imports—not from the Far East but from the West Coast: American cooks who found their calling through passion, not ancestry. This new restaurant tribe shares inspiration, ingredients, and attitude—a legacy, many of them say, of Momofuku’s David Chang—and also engages in perennial debates about ownership, appropriation, authenticity, and the F-word (fusion), not to mention who can (or should) cook this often irreverent food. (Who can eat it is less controversial, happily.) Here, some of today’s foremost practitioners. Erstwhile lawyer, chef-co-owner, Baohaus (238 E. 14th St., nr. Second Ave.; 646-669-8889). It’s not fusion, it’s: Authentic Taiwanese. Favorite ingredient: Shallots fried in lard. Favorite cheap eats: Great NY Noodletown, Village Yokocho, El Malecón, and WonJo. Chef, No Name Bar (597 Manhattan Ave., nr. Driggs Ave., Greenpoint; no phone). It’s not fusion, it’s: A noodle bar (in a dive bar). Background: Cooked at Pies ’n’ Thighs and Diner; started playing with Asian spices when catering vegan lunches for a record label. Favorite cheap eats: La Superior. Chef-owner, Danji (346 W. 52nd St., nr. Ninth Ave.; 212-586-2880) and Hanjan, opening this fall. It’s not fusion, it’s: Korean. Favorite cheap eats: Daheen Wong Mandoo for dumplings. Chef-co-owner, Talde (369 Seventh Ave., at 11th St., Park Slope; 347-916-0031) and the soon-to-open, cheap-eats-friendlier Pork Slope. Background: Top Chef-testant, formerly at Morimoto and Buddakan. Quirky dish: Perilla-leaf wrap with bacon-tamarind caramel. Favorite cheap eats: Yakitori Taisho. From left: Jason Wang, Miguel Trinidad, Andy Ricker, Danny Bowien. Photo by Danny Kim. Owner, Xi’an Famous Foods (various locations) and Biáng! (41-10 Main St., Flushing; 718-888-7713). It’s not fusion, it’s: Street food of Xi’an, in northwest China. Background: Business school, French Culinary Institute. Favorite cheap eats: Half a duck with rice. Chef-partner, Maharlika (111 First Ave., nr. 7th St.; 646-392-7880). It’s not fusion, it’s: Modern Filipino. Background: Chef at Lola, where he met Maharlika partner Nicole Ponseca. Signature dish: The sisig, a plate of pig face and belly. Quirky dish: Eggs Imelda, a take on eggs Florentine. Favorite ingredient: Coconut and palm-sugar vinegars infused with garlic, ginger, and chile. Favorite cheap eats: Woorijip and Hop Kee. Chef-owner, Pok Pok Ny (127 Columbia St., nr. Kane St., Columbia Street Waterfront District; 718-923-9322) and Pok Pok Wing (137 Rivington St., nr. Norfolk St.; 212-477-1299). It’s not fusion, it’s: Regional Thai and Vietnamese. Background: Founded Pok Pok in Portland, Oregon. Foundations: Travel and studies in Southeast Asia. Signature dish: Per diners and the media: chicken wings. For Ricker: laap meuang. Favorite cheap eats: Xi’an Famous Foods and Shu Jiao Fu Zhou. Chef, Mission Chinese Food (154 Orchard St., nr. Rivington St.; 212-529-8800). It’s not fusion, it’s: Weird Chinese food, as he calls it. Background: Sumile and Tribeca Grill, before opening Mission Chinese in San Francisco. Quirky dish: Kung-pao pastrami, inspired by his Oklahoma upbringing and barbecue.